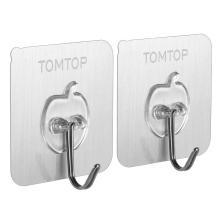 Hooks with Back Adhesive: can be firmly stick on any smooth surface. Strong Bearing Ability: max. load capacity is up to 5kg. Easy to Use: no screws or nails are used, just tear and stick. No Residue: keep a residue free surface after removing the hooks. Reliable Quality: rust-proof and durable stainless steel hook. Simple Style: brushed silver surface with our logo"TOMTOP" printed on it. Fit for most flat and dry surfaces like tile, marble, ceramic, mirror, glass, plastic, etc.